Fox News anchor Sandra Smith gave Corey Lewandowski multiple opportunities Wednesday morning to apologize for his dismissive comments about a 10-year-old with Down Syndrome separated from her parents at the border. But Lewandowski was not backing down. 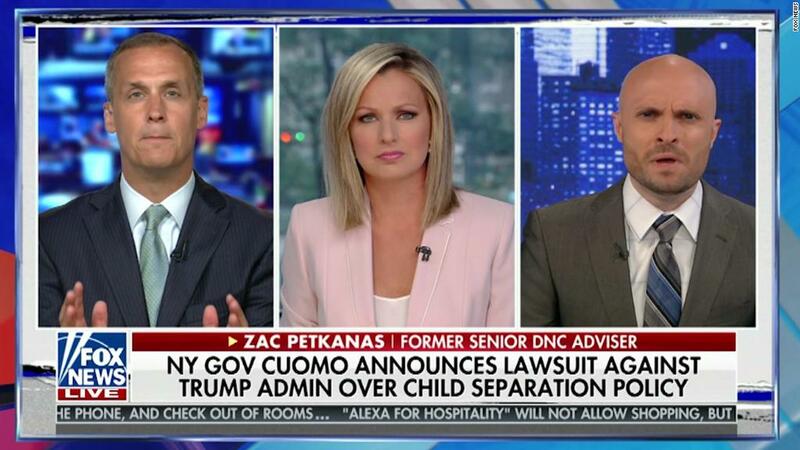 While appearing Tuesday on Fox News, the former Trump campaign manager said "Womp, womp," as his fellow guest, former senior Democratic National Committee adviser Zac Petkanas, shared an anecdote he had read about "a 10-year-old girl with Down syndrome" who had been "taken from her mother and put in a cage." On Wednesday morning, after an uproar about his comments had already begun, Fox had Lewandowski back on its air, with Smith asking if he'd like to address the comments he made that had "gotten a lot of attention in the media." But Lewandowski didn't take the opportunity, saying that he wanted to address how Petkanas was "trying to politicize the use of children." Smith threw Lewandowski another lifeline. "But to be clear, you were not speaking about the young girl with Down Syndrome who was separated from her parents at the border?" she asked. "I don't know the young girl," Lewandowski said. "I was mocking Zac, a liberal Democratic National Committee activist who is doing nothing but politicizing the issue of making an example of one particular child." Smith then pushed Lewandowski further. "I want to go back to the words and the rhetoric used around this, because it is so highly charged. It's pulling at all of our heartstrings," Smith said as she described the shelters to which babies and toddlers are being sent. "I know you, you're a parent, it's a difficult situation for us as Americans to see this happening at our border." Lewandowski, who was briefly a CNN commentator after he was fired from the Trump campaign, said no one wants to see parents separated from their children, but placed the blame on the parents for entering the country illegally. Smith went on to cite numbers of how many children have been separated from their parents every day and repeatedly asked Lewandowski whether he's talked to President Donald Trump and how the president feels about the images of children separated from their parents. Lewandowski declined to describe his conversations with Trump. Smith then gave Lewandowski one final opportunity to say that he was sorry. "There are some who saw your words last night as overlooking an individual when there are so many affected by this. Do you feel you owe an apology of any sort?" she asked. But Lewandowski was not backing down. "An apology? I owe an apology to the children whose parents are putting them in a position that is forcing them to be separated. We owe an apology to Jameel Shaw and Brian Terry and Kate Steinle's family who have allowed those individuals to be killed by illegal aliens. The American people owe an apology to those people. When you cross the border illegally you have committed a crime and there is accountability for committing crimes and there should be." A spokesperson for Fox News did not immediately respond to whether Fox News will continue to have Lewandowski on after his comments.